Our advisors provide helpful advice so as to help investors save more money and make more money. Fire incidents in high-rise apartment buildings all over the world have garnered attention on the issue of fire safety equipment. How safe are these buildings? Fire safety in high-rise apartment buildings has its own challenges because of the building’s design, for example, a longer time is needed to evacuate as there will be a great number of people going through the staircase during evacuation. There isn’t a need to panic. High-rise buildings are now subject to a stricter safety code. In fact, in Canada, there is a legislation requiring all multi-unit dwellings to be inspected on an annual basis. Also most of these high-rise buildings are built to be fire proofed; its design made in such a way that the spread of fire will be limited, so if a fire breaks out, it will be confined to a specific location. As an investment there is a risk and reward of large multi-story multi-unit buildings. More units equals more rental income. There is higher risk as more units means you’re increasing your risk of fire destroying the entire investment. Instead of one kitchen a typical high-rise apartment might have 100 to 200 kitchens. You’ve now magnified your fire problem. Who is responsible for safety? It is the property management’s duty to ensure the safety of its residents; but everyone must still keep watch of their own. Home fires usually start in the kitchen mainly because of unattended cooking. There are a lot of home fire stories involving cooking – pans left unattended while stove is on, frying or grilling that burned that resulted to fire – these are just some of the reasons, all pointing to the same culprit that is unattended cooking. In a report from NFPA (National Fire Protection Association) from 2010-2014, unattended cooking made up one-third (33%) of reported home fires. People nowadays are easily distracted by TV, phones, computers, or sometime, with babies crying that they leave their cooking unattended. In a survey made, the respondents admitted they are guilty of having done one or two of the things mentioned while cooking. Multi-tasking is tempting especially when you wanted to get things done the sooner, but cooking is an activity that should be enjoyed and not one to cause injury. It is advised to always stay in the kitchen when cooking, and if you need to leave, turn off the stove and other electronic equipment in the kitchen that could start a fire. Residents in high-rise apartment buildings must properly educate themselves to a fire safety plan. Yes, accidents happen no matter how careful you are, but when it does happen, isn’t it nice that you are prepared? As a responsible property manager of high-rise buildings, there are safety precautions that you can do to help avoid fire incidents. Ensuing every unit has a working fire extinguisher is one simple precaution. A fire extinguisher is a handy dandy device that is used to efficiently control small fires. Most of the time a fire can be controlled by the use of fire extinguisher alone. According to research done by the NFPA, for approximately 80% of all fire incidents, a simple portable fire extinguisher can put out a fire and lessens the impact or damage that the fire can cause. There are different types and classes of fire extinguishers in the market, each with its own purpose. For home use, it is best recommended to have a combination of ABC. As the name suggests, this is well suited to put out all three fire types. 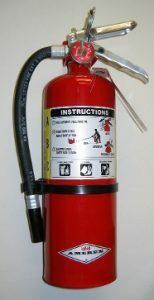 Many of the fire extinguishers sold for home use are labelled such. If still unsure, get in touch with professionals or trained individuals who can help you with its proper usage before buying. A quick guide on the how to use a fire extinguisher is to follow the PASS method. Pull the extinguisher’s safety pin. Aim the chemical at the source of the flames rather than at the flames themselves, standing at least 6 feet from the fire (or as directed on the extinguisher’s label). Again, property managers and building owners need to know the fire safety code, develop and practice with their tenants their own safety plan. Do not compromise human safety. Material possessions and property can be replaced at any given time, but the lives and safety of the people around you should not be put at risked. Understanding the importance of having a fire extinguisher in the kitchen could help avoid the risk of damage and/or injuries. Society’s silent hero – as people call it. A fire extinguisher is a good equipment to invest in. Spectrum United hopes that you never get to use it, but an extinguisher is money well spent when you have a situation where you need it.